A couple of weeks ago I participated in a great workshop where we constructed “book box games”. Essentially, each of us were given a wooden, book-shaped box with a vintage book cover pasted on the front. The challenge: design and construct a game on the theme presented by the book cover that, when completed, fits entirely inside the box. My selection? 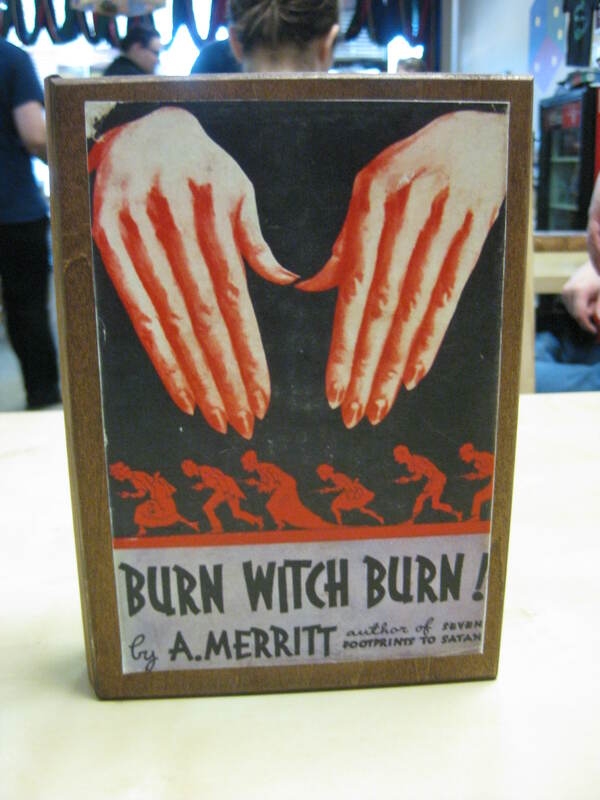 Burn Witch Burn! The family game of zealotry and pyromania! We were also presented with tons of great little chunky bits with which to construct our games. I selected a series of mosaic tiles and some wooden pawns and came up with a rather interesting (if I do say so myself–and I think I just did) elimination game. 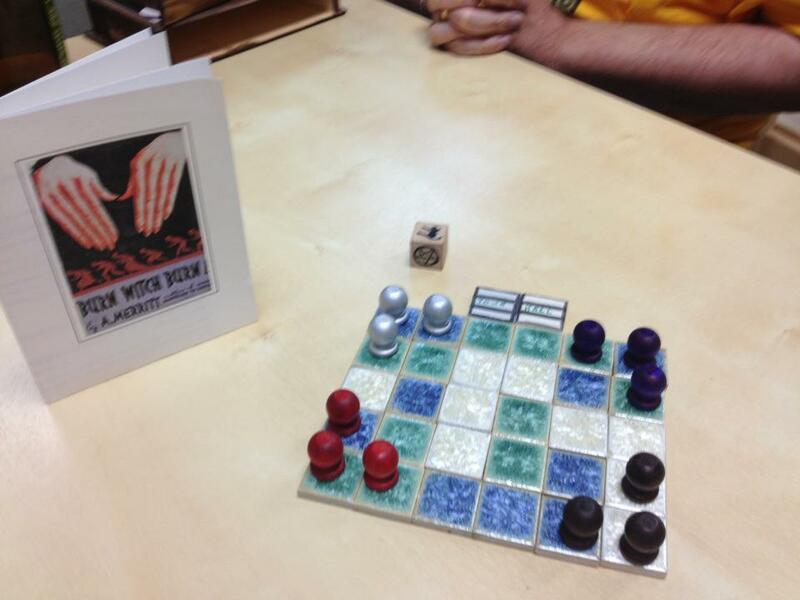 Each player has three pawns (“citizens” or “potential witches”). You get three moves per turn and the different tiles represent different terrains around the community (blue=water [3 spaces], green=woods [2 spaces], and brown=open [1 space]). If you land on an opponent’s pawn, they are sent the Town Hall space to go on trial. That’s where the special trial die is rolled, which was made with the help of my lovely artistic director (i.e. The Wife aka The Princess). If the trial die comes up with a hex sign, then person who accused the witch gets hexed and must miss a turn. If the die comes up with nothing, then the accused goes back to an available starting space. If the die comes up with the black cat–then yell “BURN WITCH BURN!” cause that pawn has been found guilty and is eliminated. Once all the competing pawns have been burned (i.e. the whole town is now all the same), then you win! I had a great time with the project and it even tied for first place among the other games made in the workshop (as voted on by the participants). I want to thank Roll2Play game store for hosting the event and Mr. Brian Bird for presenting this brilliant way to spend a weekend!